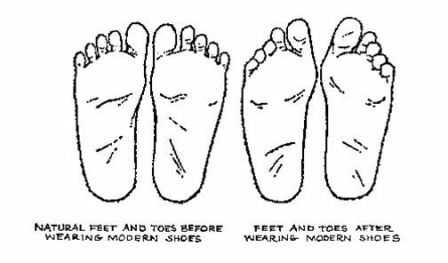 You are here: Home / Foot Care Blog / Toenail Fungus / What Causes Toenail Fungus — Tight Shoes? Can Tight Shoes Cause Toenail Fungus? According to Web MD, people who are worried about toenail fungus infection should avoid tight, enclosed shoes. “Injury to the tips of the toenails because of tight shoes may be the biggest single factor that leads to recurrence of a fungal nail infection,” they write. The Cleveland Plain Dealer blames tight shoes and an older population for the rise in onychomycosis. It affects 32 percent of the population between the ages of 60 and 70, and nearly half of all people by age 70. However, young people can get toenail fungus too if they are exposed to the pathogen and have a cut in the skin whereby the fungus can enter the body. What Causes Toenail Fungus: Dirty Shoes! Tight shoes are not the whole story, however. Tight shoes may cause cuts and injuries to the toenail that can invite fungus in. Of course, you need to also come into contact with that type of dangerous fungus as well. There are over 100 types of fungus on our feet right now — but not all of them cause adverse reactions in the body. Walking around barefoot makes the body more vulnerable to attack, but so does wearing dirty, contaminated, wet shoes. The Center for Foot & Ankle Care in Florida recommends using the patented SteriShoe ultraviolet shoe sanitizer as part of a complete treatment for onychomycosis. This device kills off up to 99.9% of the harmful organisms in the shoe. While you should still do your best to keep your feet dry by choosing socks and shoes wisely and alternating pairs of shoes, SteriShoe is an important part of the prevention process, especially if you’ve had recurring brushes with the fungus.